Guernsey head coach Jordan Reynolds says the club's new name is a positive move for the island side. 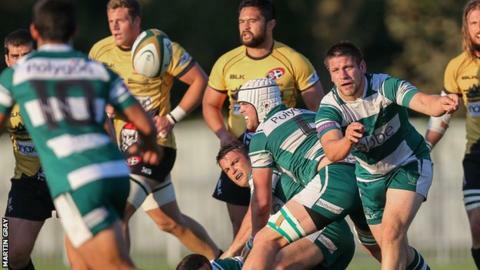 They travel to face London Irish Wild Geese on Saturday in their first game as Guernsey Raiders. "We've had 102 years with just Guernsey Rugby Club, it's changed now to the Raiders, which gives us a little bit more identity," he told BBC Guernsey. "It's all positive for the club, it's a fun name that we can all get used to and the players seem to love it." Guernsey are hoping avoid a repeat of last year's difficult campaign in National Three London, when they managed to avoid relegation after being bottom of the table in February. "We've managed to keep our core squad from last year and keeping that continuity is great for us," Reynolds said. "In previous years we made big changes in the squad as we tried to get the right formula. "Last year with all the injuries and the position in the league I was pretty comfortable with the squad we had, I just wanted to keep that for this year."